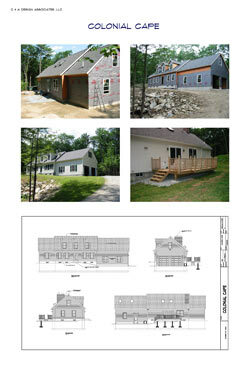 Below are some of our past new home and addition design projects in New Hampshire. Our customers are thrilled with a large 13 x 15 family room with a bank of three windows that provide light and a great view of the back yard. There is a window seat underneath it and site-built bookcases on either side. The guest room serves as an office when the family is not entertaining, and the new mud room and laundry are working out beautifully! A second story was added to the garage of this 1992 Garrison and provided the family with a large and comfortable study/play/media room. Special soundproofing was added since the parent’s bedroom wall is adjacent to one side of the new room. Downstairs new mud and laundry rooms help keep the house well organized. This efficient design used space in creative ways. For example, pull-out drawers for dirty clothes were added to the area under the stairs. This feature allowed the family to make use of use what would ordinarily be ‘dead’ space. This Bedford Cape built in 1958 was too small to accommodate a growing family. Closet space was minimal; the one bath in the house too small to allow for washing and dressing the kids, and more bedroom space was needed. 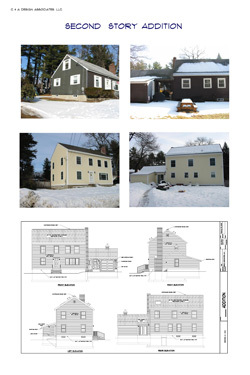 Working with the couple, we designed a two story colonial featuring a large Master Bedroom with cathedral ceiling, a large upstairs bath, and extra bedroom. There was even room for an office space which could double as a bedroom should the need arise in the future. The owner’s Cape featured here is the house that launched C & A Design Associates, LLC. 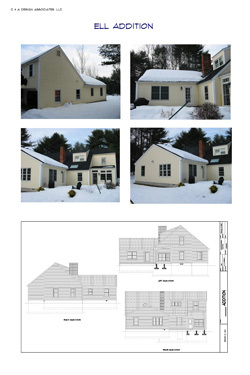 We used these first plans as a test case, and asked our builder to let us know if there were any problems with the plans – Was there enough information? Were the plans logical from a builder’s perspective? 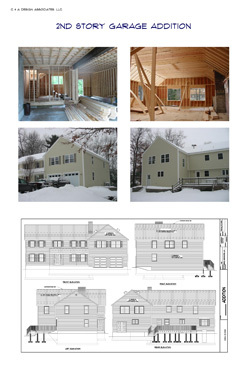 Could these plans be accepted by the building inspector? We worked closely with the builder throughout the construction cycle and found that there were no major problems with the plans as designed. We also discovered that we enjoyed the process enough to want to do it as a business, and the rest (as they say) is history!